The first week flew by. By the middle of the second week, the familiar tummy cramps set in. The fever was yet to descend so off we went to India’s premier North Indian restaurant. With a cup of chamomile tea, and a stern warning from the manager, I deep dived into Maa Ki Dal, a ghee laced bread basket and soft, spicy kebabs. The stuff of heaven. Hell was soon to follow. Bundled into the car afterwards, I told driverji to find me the nearest pharmacy. It was late at night, the options were limited. I soon found myself ducking stray dogs in a local fruit and vegetable mart, which handily housed a shiny pharmacy. I flung myself inside. Hello, I have come from London. And then launched into a sordid recount of the painful symptoms. Was this man telling me off? Now, I know Bengalis have a particular affinity with medicine. But it was late, and I was being given a dressing down by the owner of the only open pharmacy in the locality. I started blubbering a response. Translating feebly to my man. Who by this time had started taking portraits of the quasi medicine man. This was quite enough. Are you a doctor? “I am a homeopath,” he proudly declared, breaking into the widest grin. His assistant finally handed over the stash of the OTC drugs I was really after. 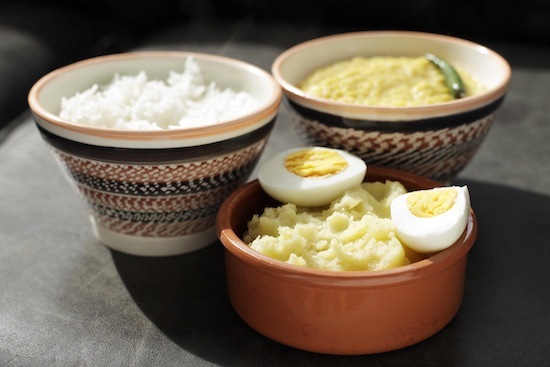 There are a few things Bengalis eat to settle the stomach. But Sheddo Bhaat has to top the list. This is basically rice, lentils, vegetables and eggs, boiled, subtly flavoured, and then eaten with bits of broken green chillies. You can cook it all together, or at least cook the rice together with the veg and eggs, and the lentils separately. Vegetables that can be used here include pumpkin, potol (pointed gourd) and karela (bitter melon). Wash the lentils thoroughly and set to boil with cold water. When it starts bubbling, use a wooden spoon to scoop out any foam/scum that rises to the surface. Then lower the heat to a medium, mix in the turmeric, and cook for about 20 minutes until you get smooth cooked lentils with the texture of a very thick soup. If the lentils dry up too quickly, add some hot water and stir to prevent sticking. Stir ghee and salt in to finish, cover and set aside. Peel and boil the potatoes, boil the eggs and cook the rice. I boiled the eggs with the potatoes, fishing them out after they boiled for about 15 minutes. I know that some people boil the whole lot together, simply shelling the eggs later. Mash the potato well, adding salt and the mustard oil in. Shell the eggs. And that’s your lot. Just mix the dal, lentils, potatoes and eggs together, squish a green chilli into the mix and get stuck in. Sheddo Bhaat is also lovely on very hot days, as a soothing and cooling aid. Great story, Malika! And the recipe sounds good – I like the idea of cooking all of it together in one pot (the fewer dishes to wash, the better). Thanks also for the link to your old post with the urad dal recipe – I’ve had a bag of them in my cupboard for some time now and have been wondering what to do with them. Ahhh Mallika, seemed like I was reading my story. And I could visualise the Homeopath doctor. One question – originally does ‘sheddho bhaat’ use Basmati Rice since its more difficult to digest? I am not a rice person but I could actually finish the entire *dekchi* full of shedho bhaat! Hi Keka, the holud goes in after you’ve taken the scum off the dal. I ate it after so long… absolutely lovely! Day 1 = plain boiled rice Day 2 = plain boiled rice with half a peeled and grated Granny Smith apple mixed in . Drink lots of Chamomile tea . By Day 3 , bored to death , you’ve willed yourself to be better . Hi Mallika, A few years ago, I couldn’t resist and ate some bread pakora from the street and then paid for it, by taking meds on the flight back. Glad you’re all better. Got to try this recipe! When should I add the onions? Sorry Mona, my bad. I would add it with the turmeric when you are boiling the dal. Enjoy!